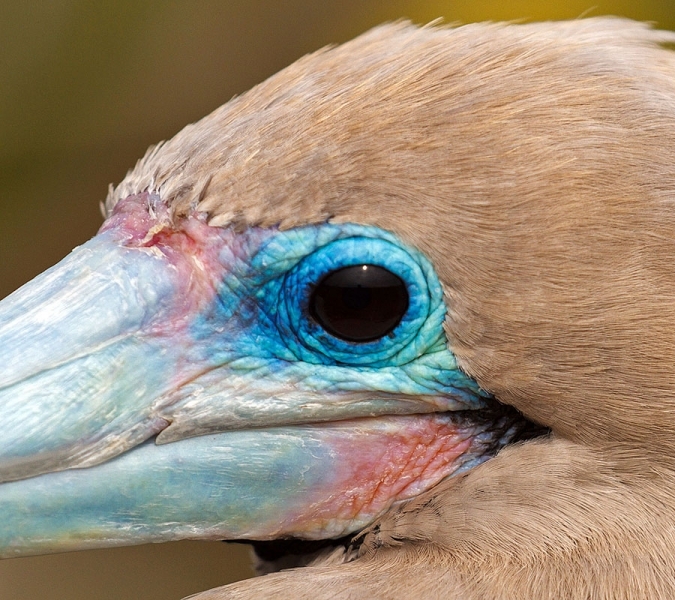 Red-footed Boobies are found in tropical & sub-tropical waters across the globe. 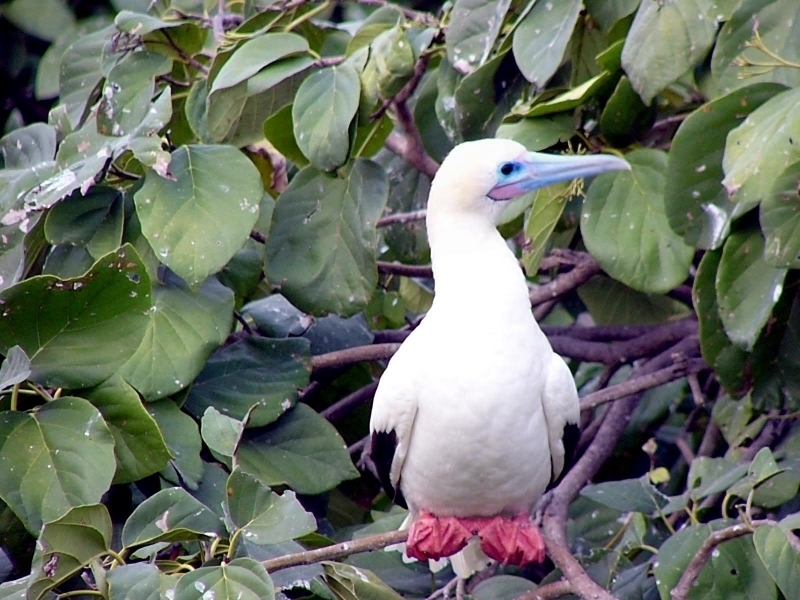 They are found in the Oriental, Ethiopian and Australian regions and are also found on various small oceanic islands. 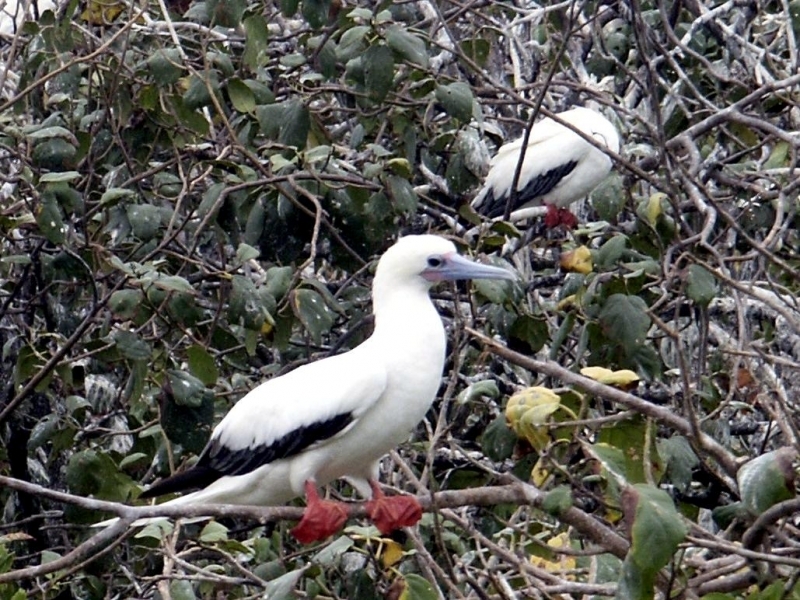 They take long hunting trips of up to 150 kilometers from their breeding grounds but do not migrate. 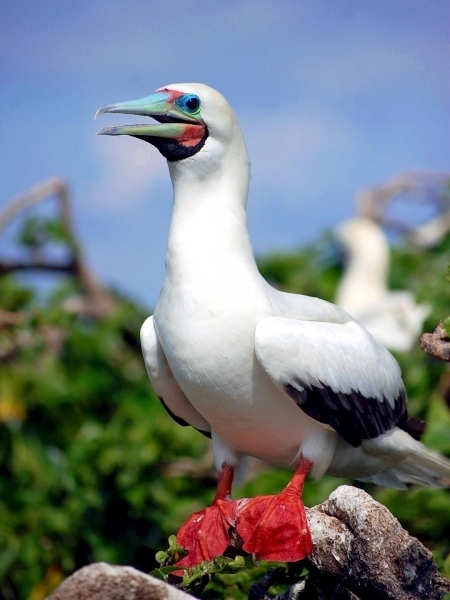 The word “booby” comes from the Spanish “bobo” meaning “stupid fellow” and was probably inspired by the bird’s clumsiness on land. 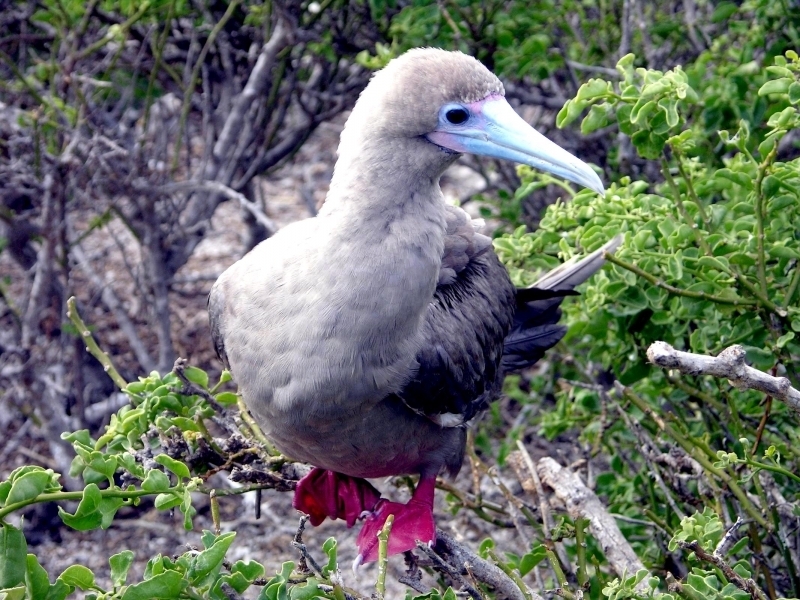 One of the largest populations is on the Galápagos Islands. 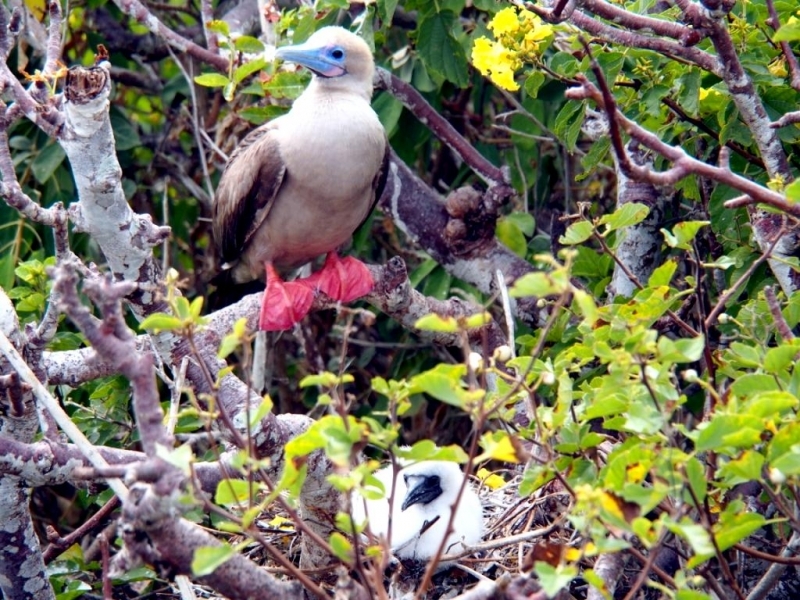 Red-footed Boobies make their nests in the tops of trees on islands and coasts in tropical regions. 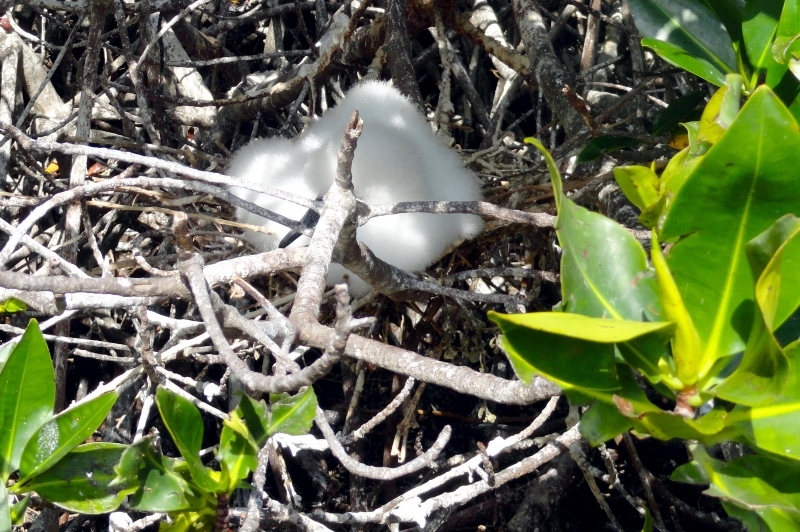 They may also nest in low scrub. 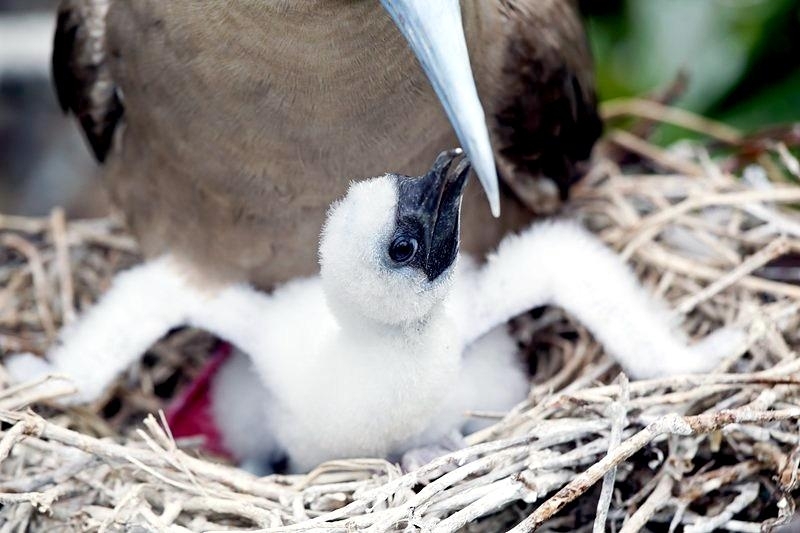 They inhabit islands & coastal regions in the tropics, because they prey on fish in pelagic regions of the ocean. 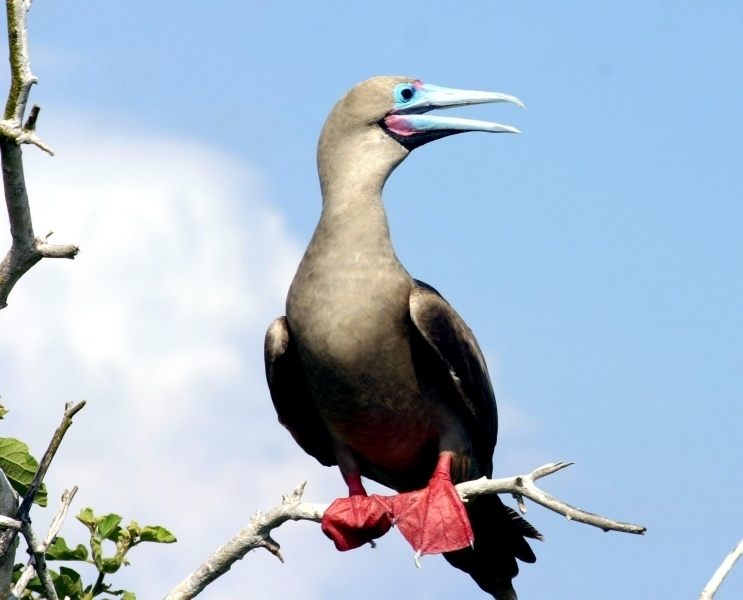 Red-footed Boobies are the smallest booby and is well suited for its long flights out to sea in search of prey. It has strong neck muscles and a wedge-shaped tail. It has a long, tapering bill with serrated cutting edges to help catch and eat its prey. 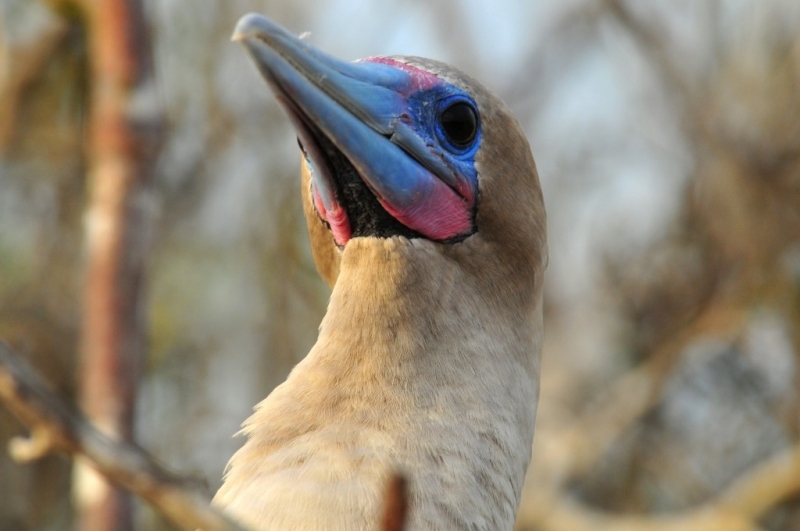 Its external nostrils are closed to allow for plunge-diving but it has developed secondary nostrils beside the mouth which are automatically covered by flaps when it plunges. The skin around its face is generally bare. The eyes are beside the bill, face forward and have very pale irises. 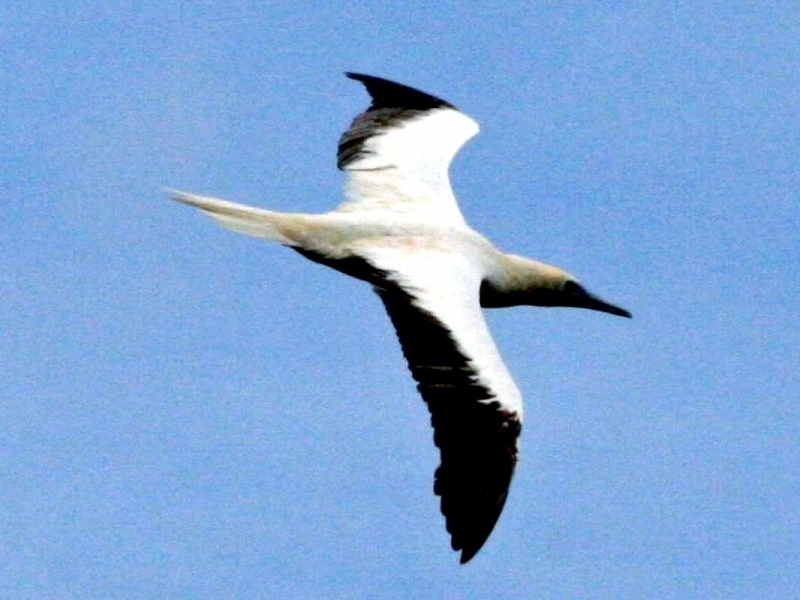 The wings are long, pointed and situated fairly far back on the body. 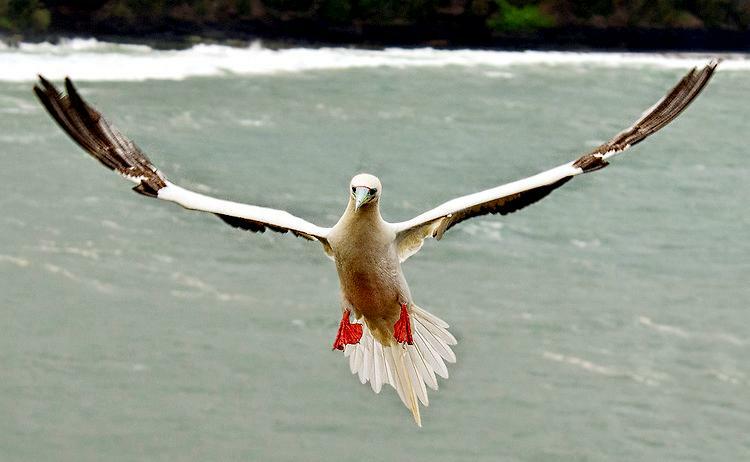 They help the bird to fly in high winds which it does by alternating powerful flaps with gliding and also to dive. 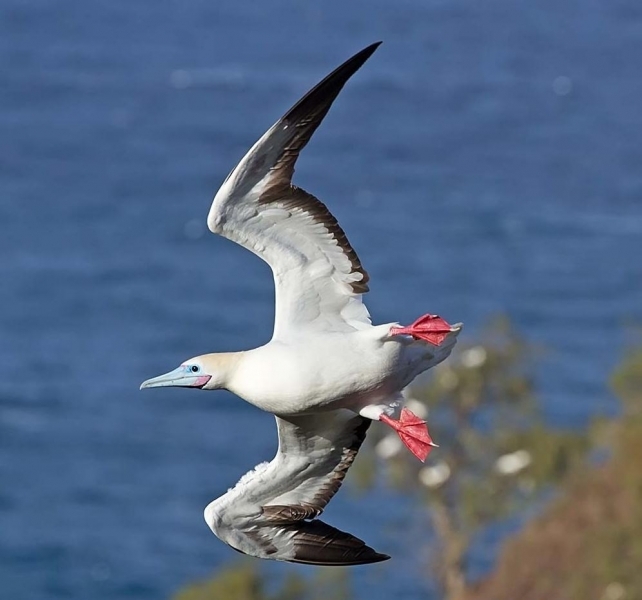 When diving, the wings close around the body of the bird making it more aerodynamic. The legs are short & strong and the feet are large and totipalmate (webbed between all 4 toes). 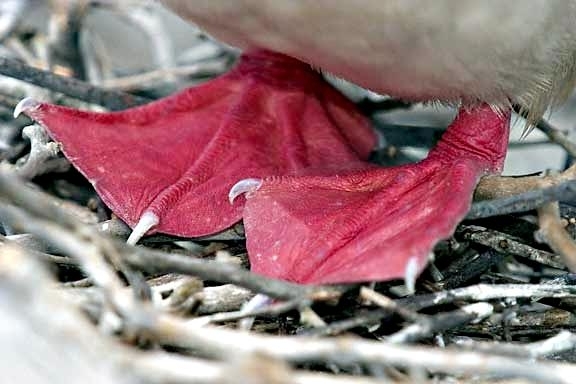 The feet are highly vascular because it is through the feet that heat is transmitted from the parent to the offspring. The legs are set far back on the body, helping it to swim. 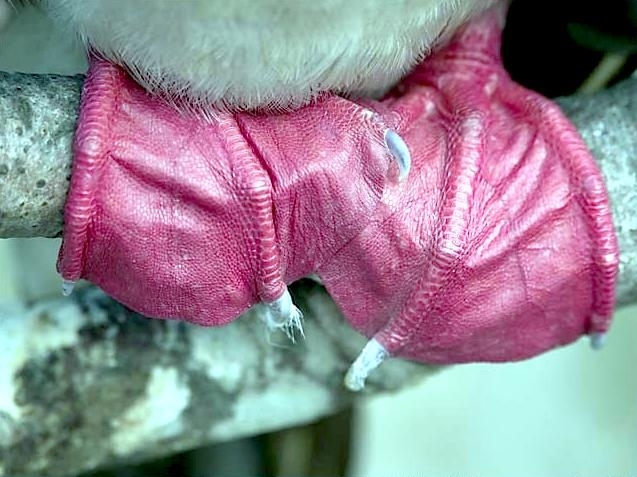 The feet & legs are also red, thus giving this seabird its name. 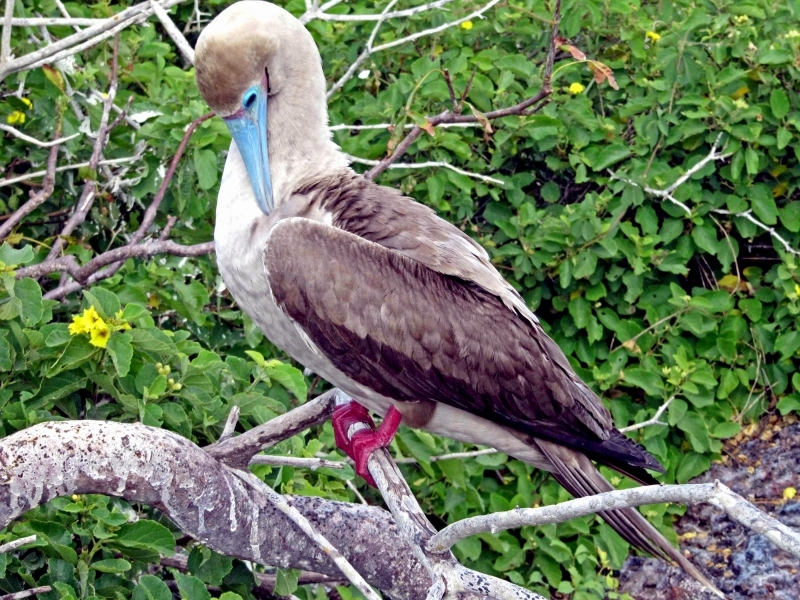 Red-footed Boobies are very buoyant, having developed a series of air-sacs which are extensions of the bronchi. They help in its plunge-diving. 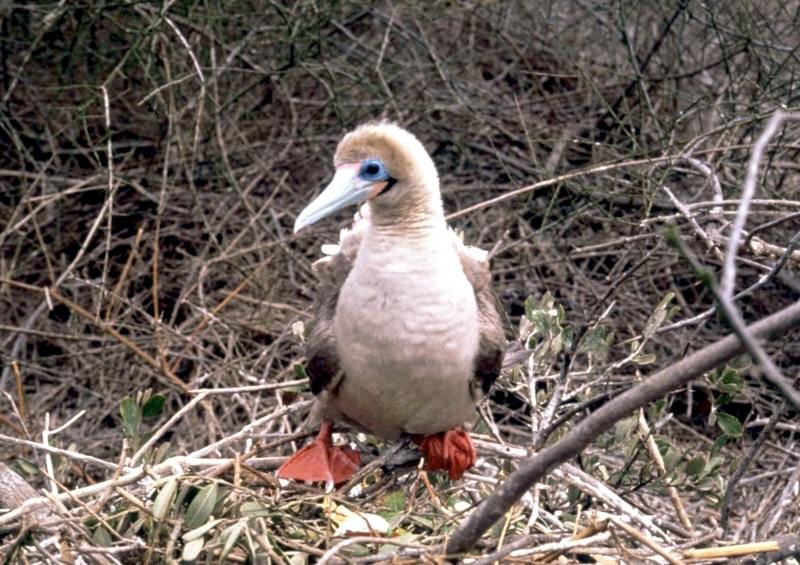 The plumage of Red-footed Boobies must serve 2 purposes, camouflage and body temperature maintenance. 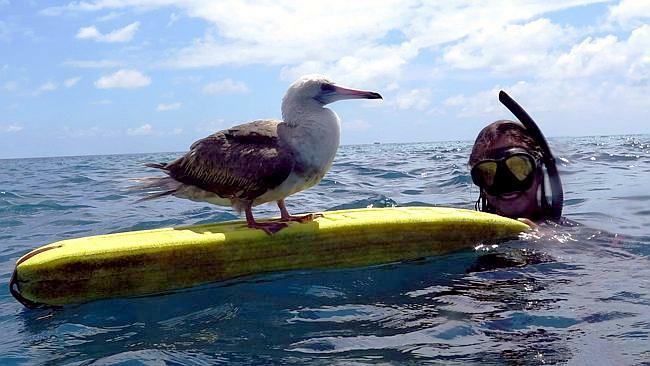 The underpart of this seabird is generally white, so as to provide counter-shading to help prevent its prey from seeing it. 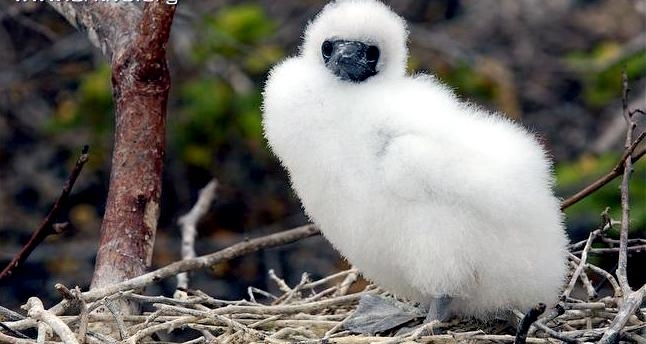 Also in an environment where both salt and the sun intensify the effects of feather abrasion, dark, melanin-rich feathers on the upper parts help to provide stronger resistance. 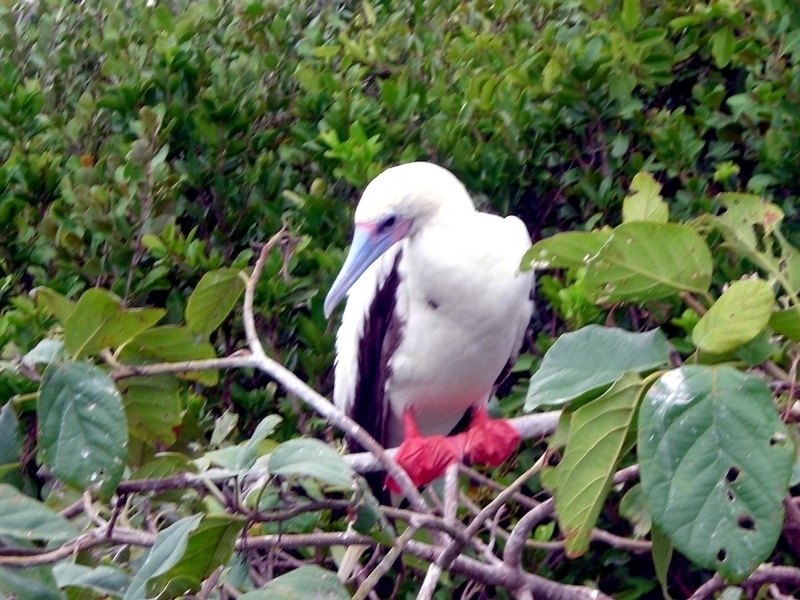 The plumage is molted continuously so as not to hinder the bird’s flight capability, however molt is suspended during breeding. Feathers are renewed 1 to 2 times yearly. 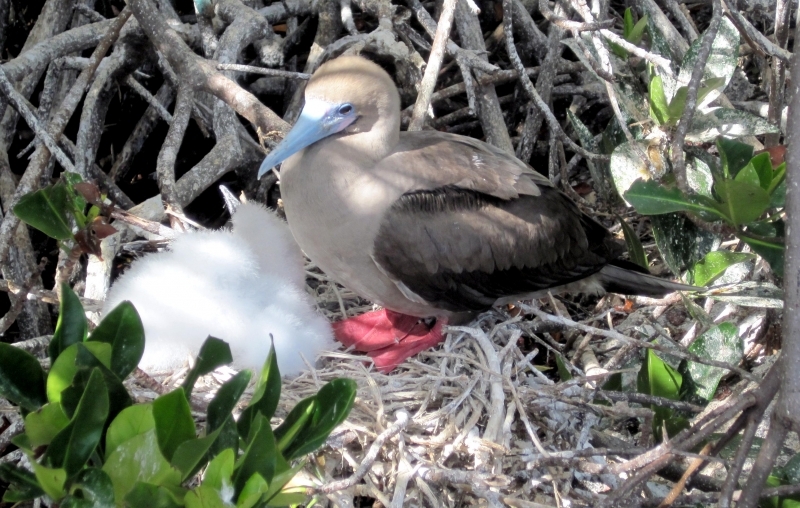 Red-footed Boobies lack a brood patch because it would interfere with streamlining & insulation. 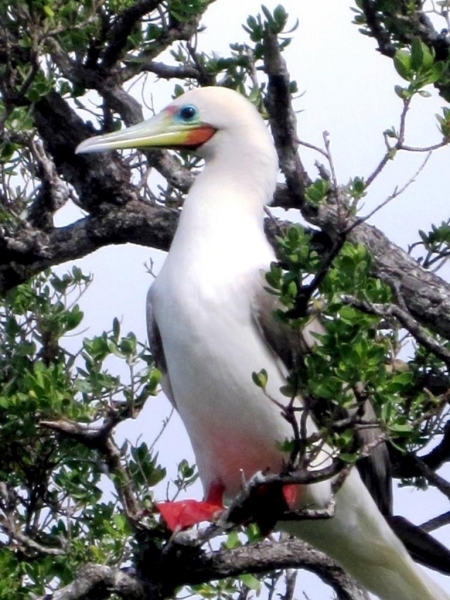 There are several morphs of this bird, often making it difficult to identify without noting the color of its feet. 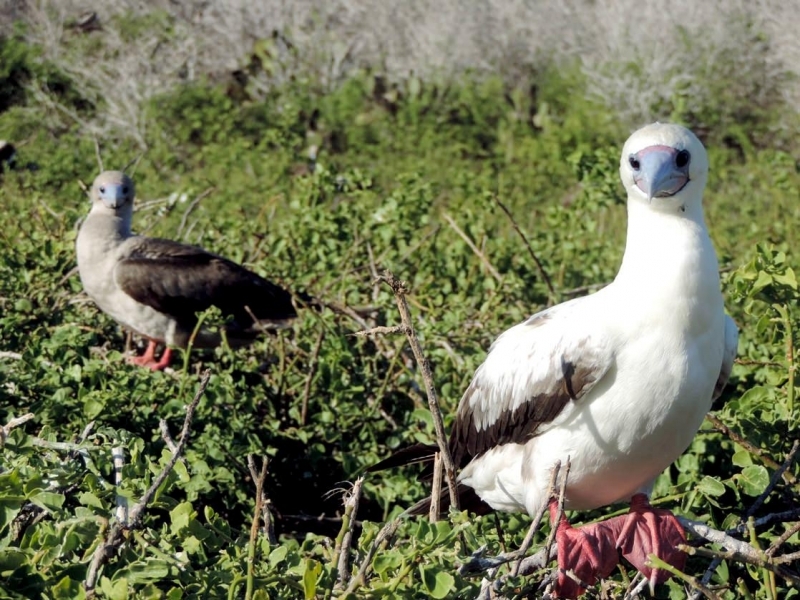 The morphs are: the white-tailed brown morph, the white headed and white tailed brown morph, the white morph which has black on its wings, the black-tailed white morph found on the Galápagos Islands and the golden white morph found on the Christmas Islands. 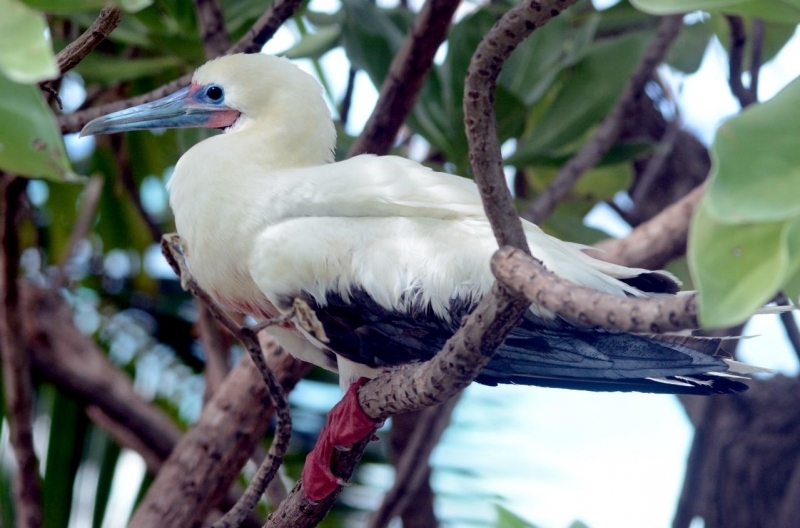 Red-footed Boobies are 70 to 71 centimeters long, on average and have a wingspan of 91 to 101 centimeters. They weigh from 900 to 1,003 grams. Females tend to be slightly larger than males. 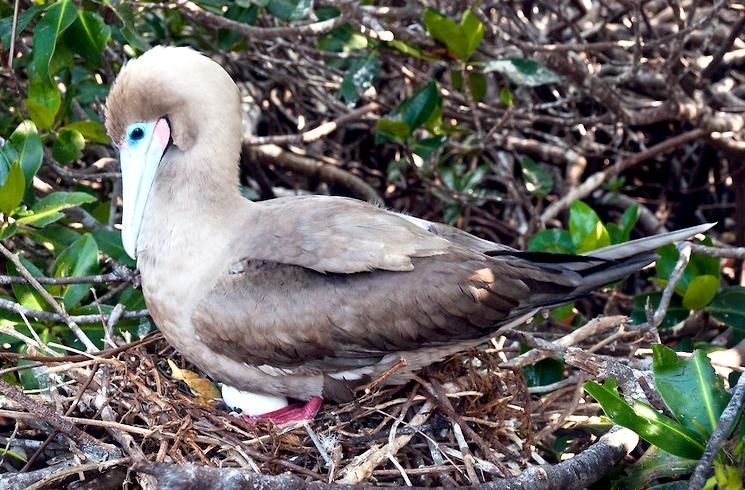 The female Red-Footed Booby lays only 1 egg. 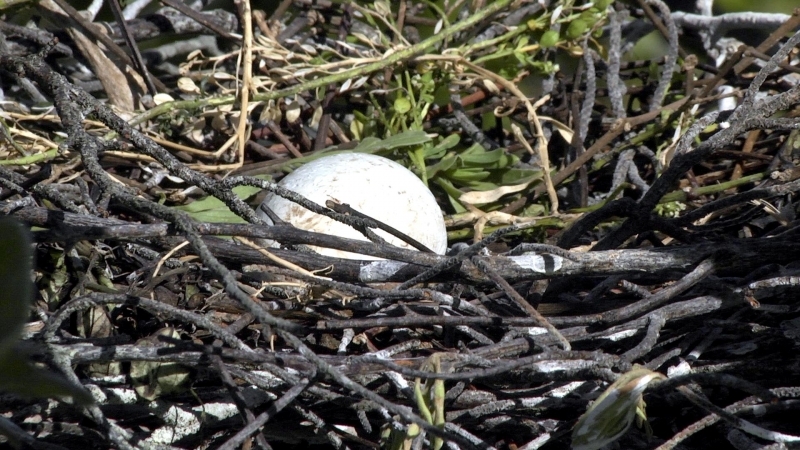 The egg is a pale color and are covered in a chalky residue. 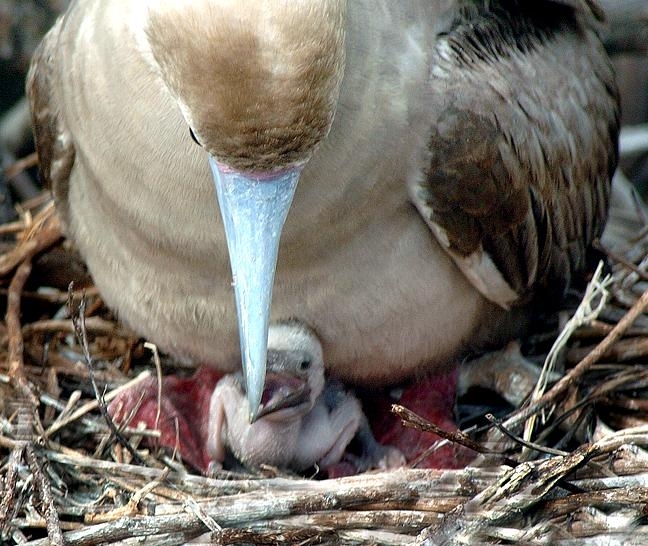 The parent keeps the egg warm by placing its feet on the egg. 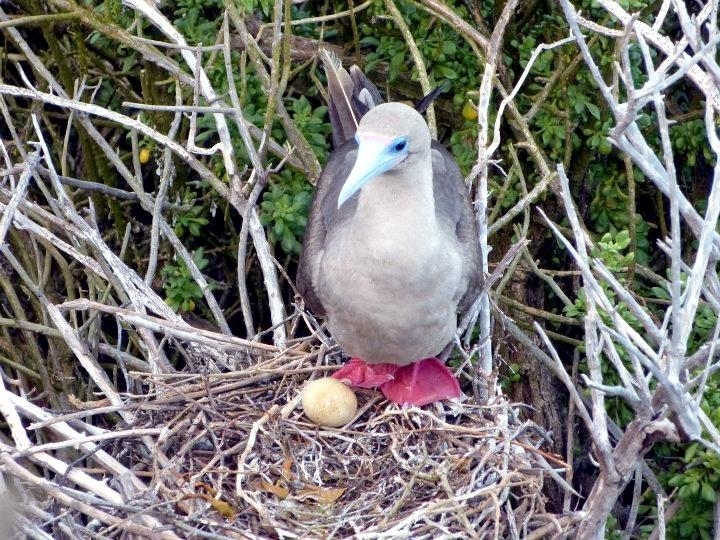 As the parent stands on the egg, it is usually very strong. 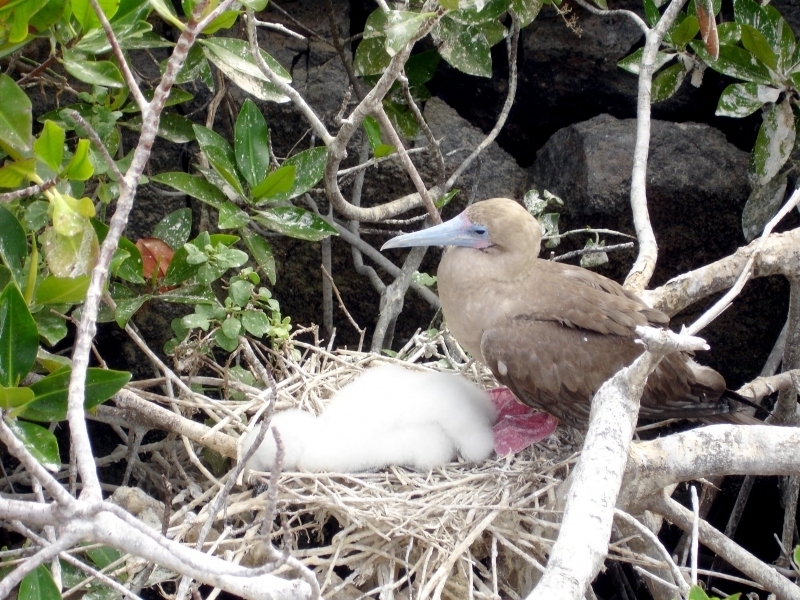 The egg is generally 5% of the mother’s total weight. 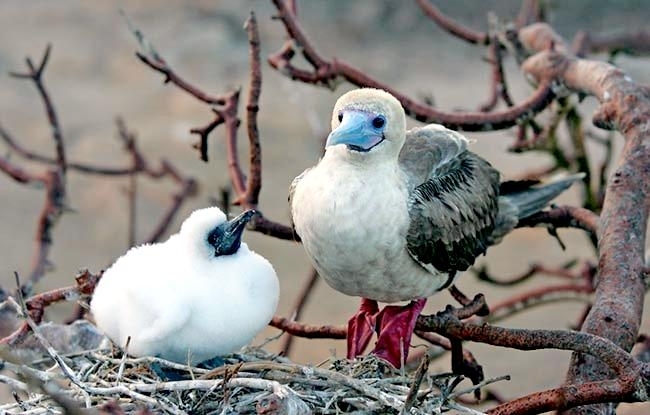 Incubation lasts for 41-45 days and the parents take turns guarding/warming it in stints which last anywhere from 12-60 hours. 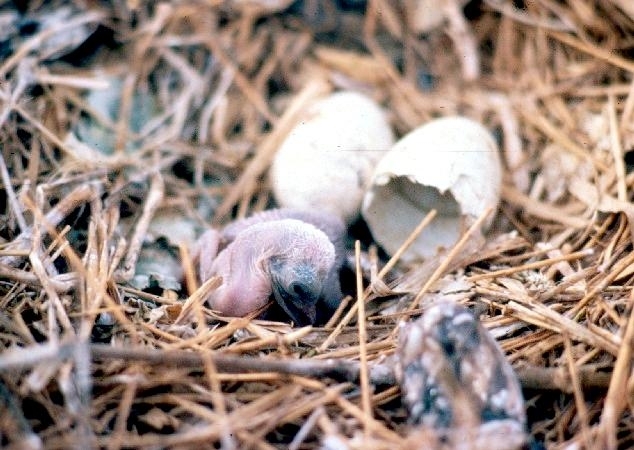 Upon hatching, the chick is near-naked having no feathers. 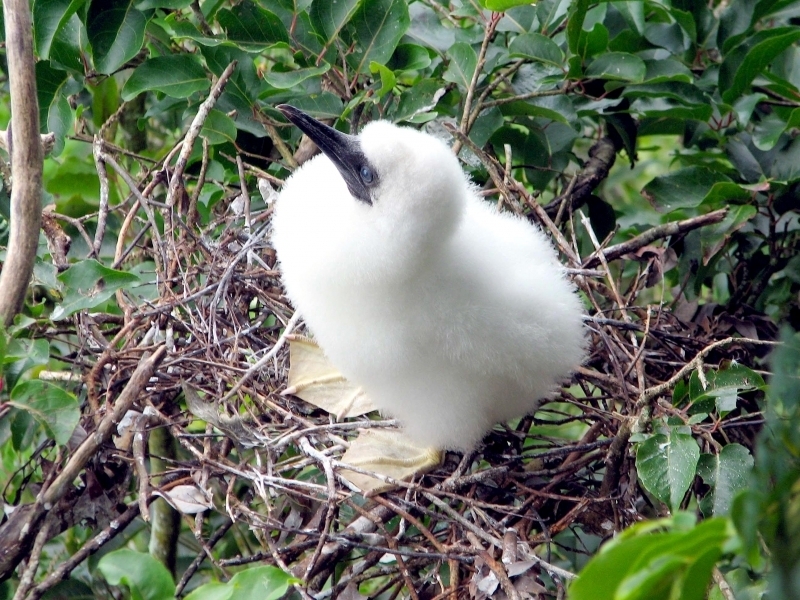 It broods on the feet of its parents for the first few days and is not left unattended until approximately one month old when it can regulate its own body temperature. 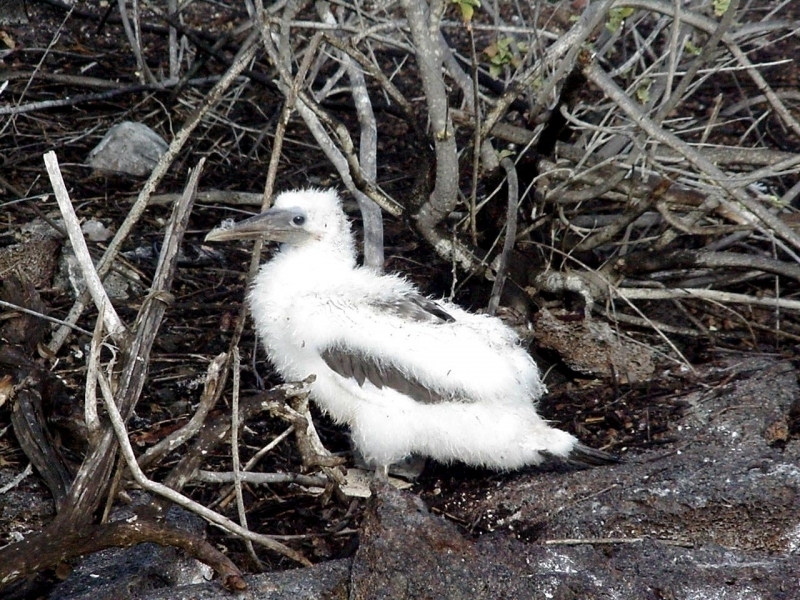 Chicks are generally a whitish-brown color. The young feed from the parent, eating from it’s mouth. 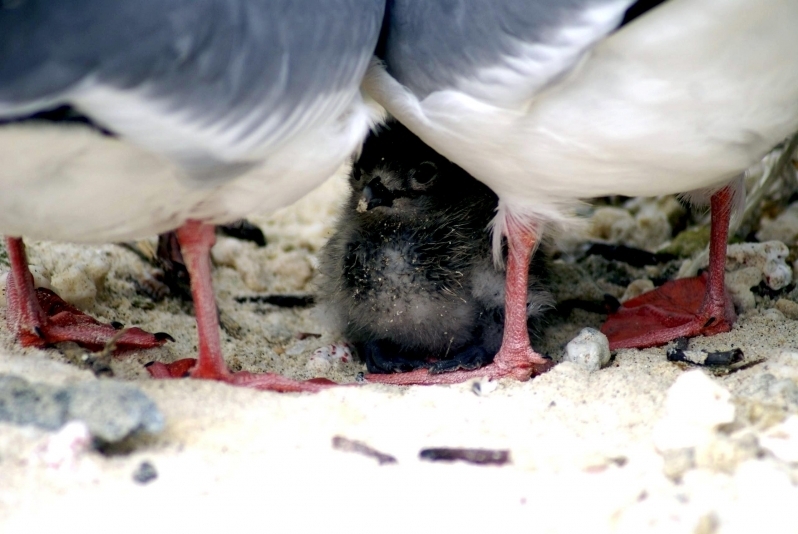 The fledgling phase lasts from 100-139 days, and post-fledgling care lasts for about 190 days. Juveniles are brown or grayish-brown with yellow-gray legs. 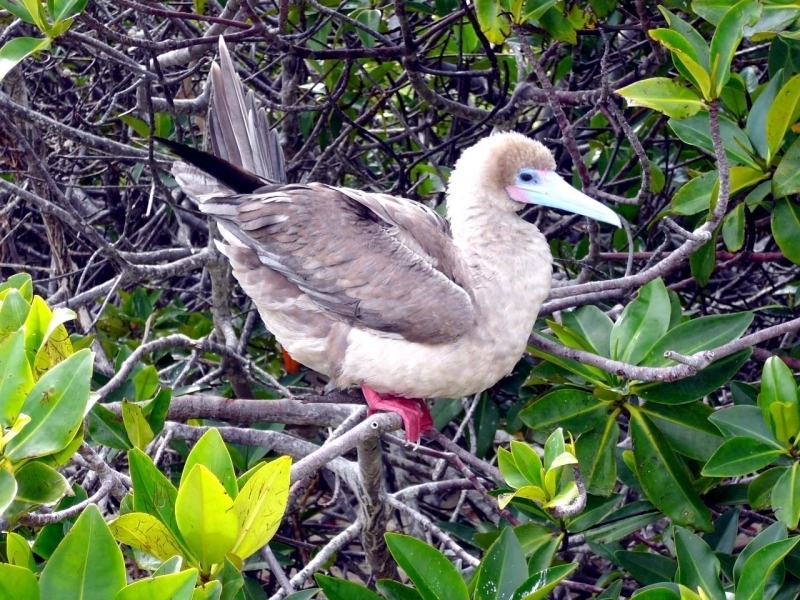 Red-Footed Boobies molt several times per year, going through several stages between the brown juvenile and the white adult. They are ready to breed at 2-3 years. 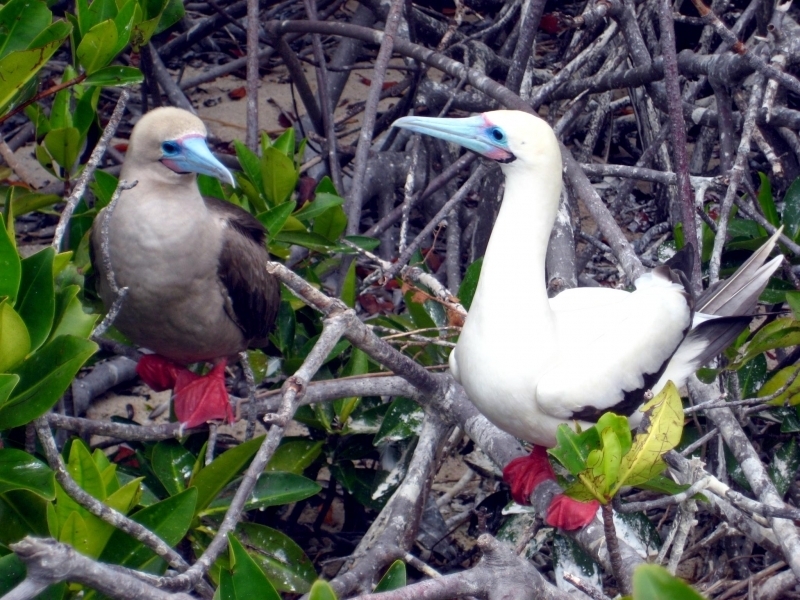 Since Red-footed Boobies are colonial & highly social, mating/courtship rituals and displays are very important. The higher the population density, the more ritualized their behavior. They show off their wings and feet, and display postures. Movement is displayed by the “Bill-Up-Face-Away” posture. The “Facing-Away” and “Bill Tucking” postures inhibit aggression. 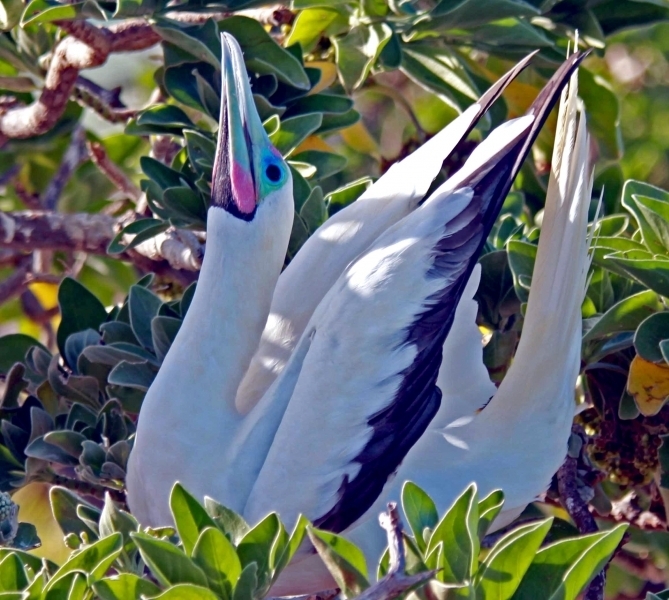 Males posture with their tails, beaks and wings facing upward and call for mates. 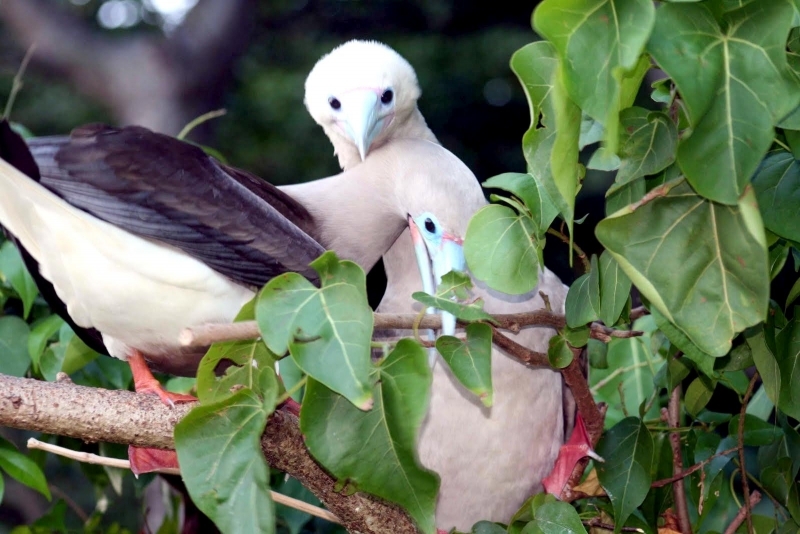 Once a monogamous pair mates, they will return to the same nest year-to-year to mate. 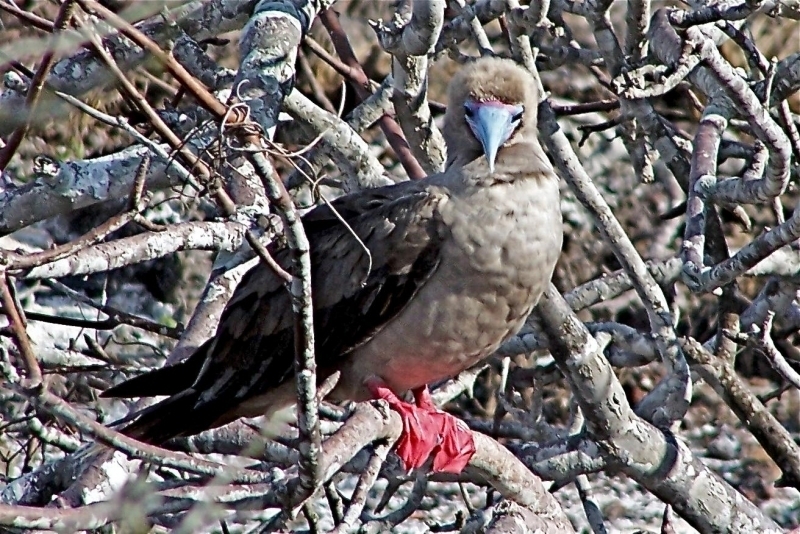 Red-footed Boobies mate approximately once every 15 months, depending on food availability. 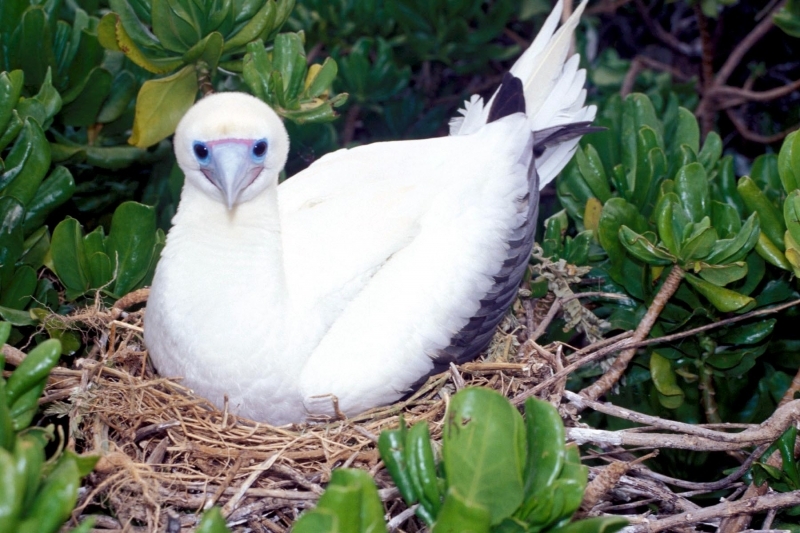 They are known for their somewhat flimsy, unstable nests which are often damaged by storms. 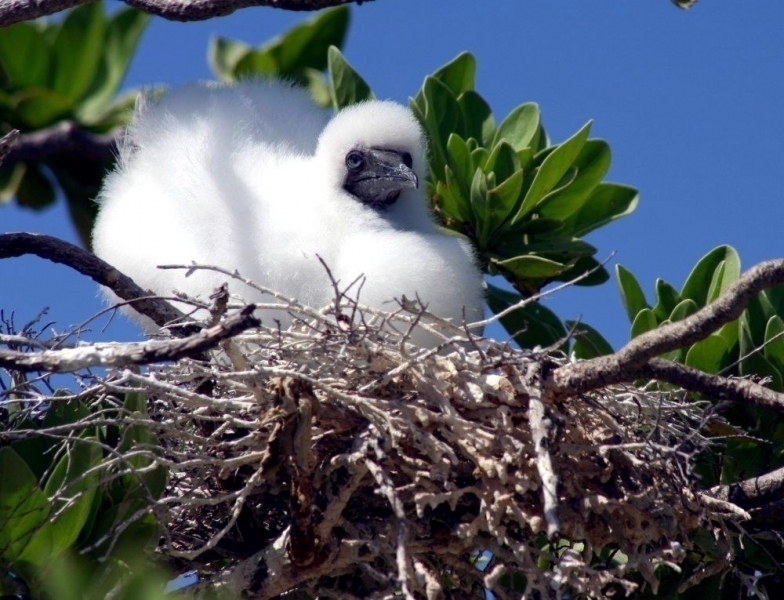 They often build their nests in trees. 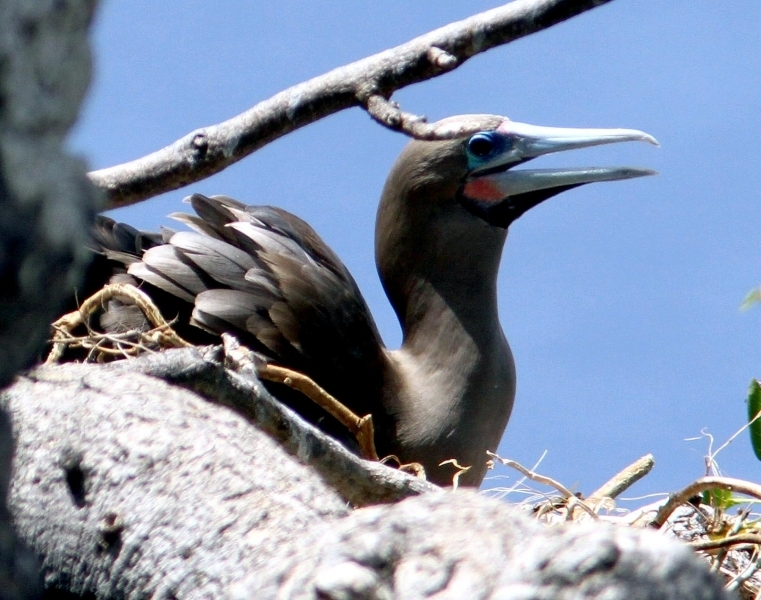 Their choice of nest location may be a way to avoid competition for space, since other species of boobies nest on the ground. 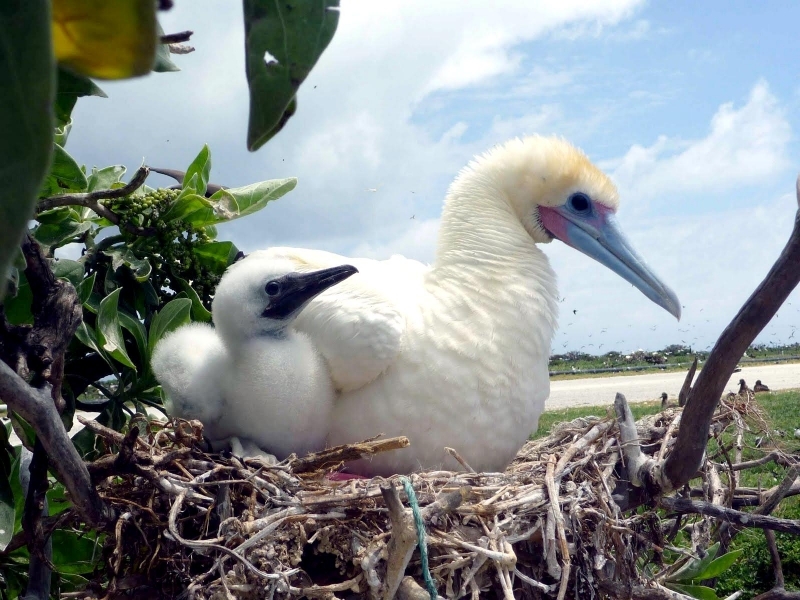 Incubation lasts between 41 and 45 days and the young fledge as young as 91 days old. 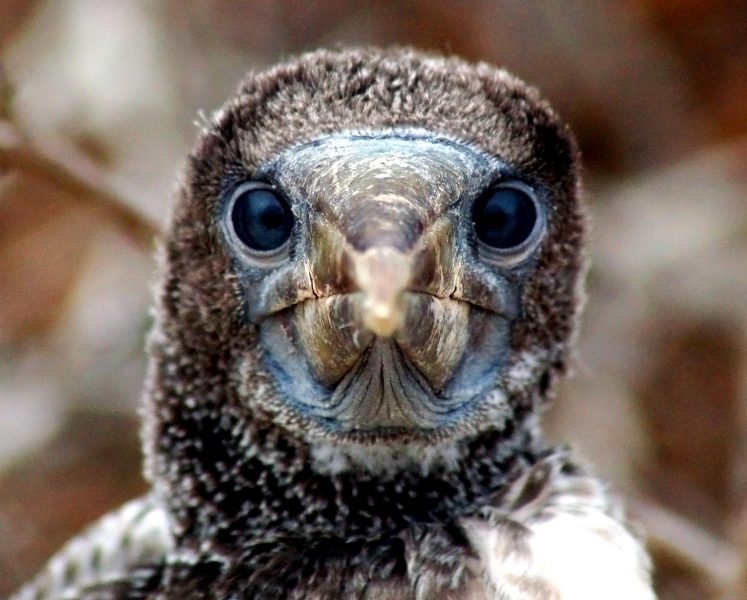 In El Niño Southern Oscillation years when food is scarce, fledgling may occur at more than 139 days old. 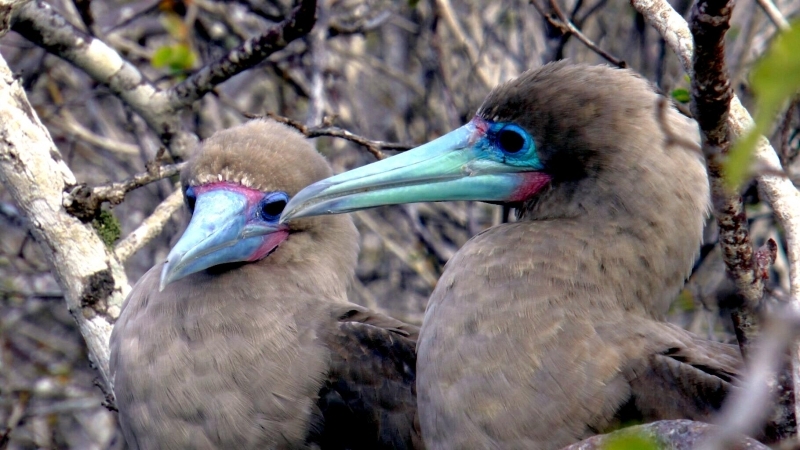 Red-footed Boobies reach maturity in 2 to 3 years. 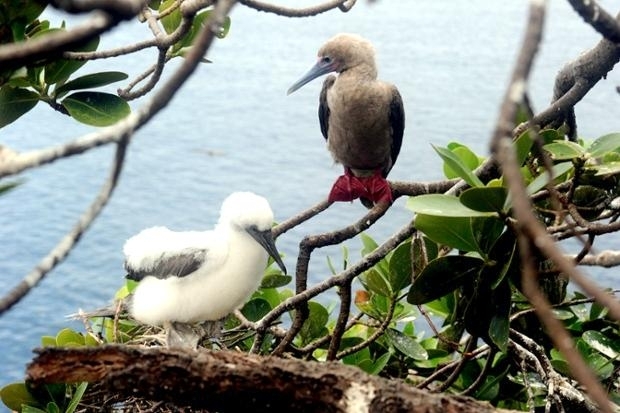 Red-footed Boobies nest colonially with hundreds of mating pairs together in one location. 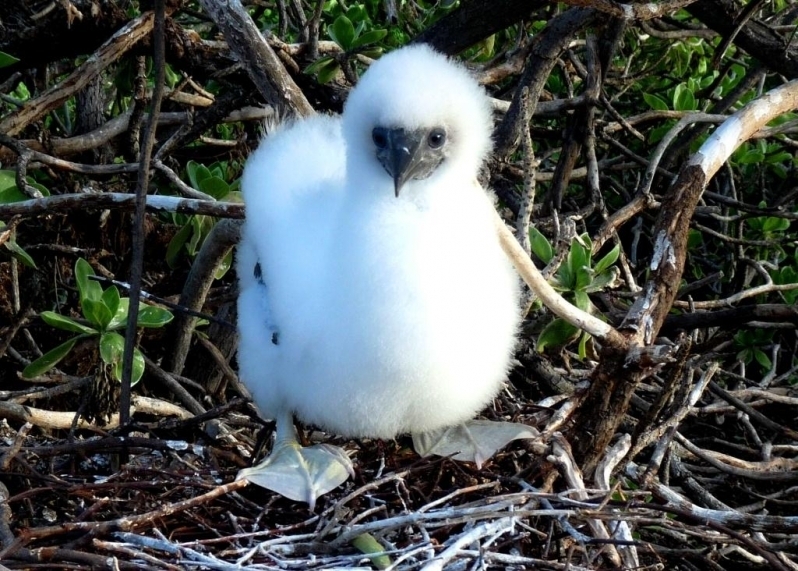 Incubation lasts between 41 and 45 days and the young fledge in one month. Both the male and female care for the young. 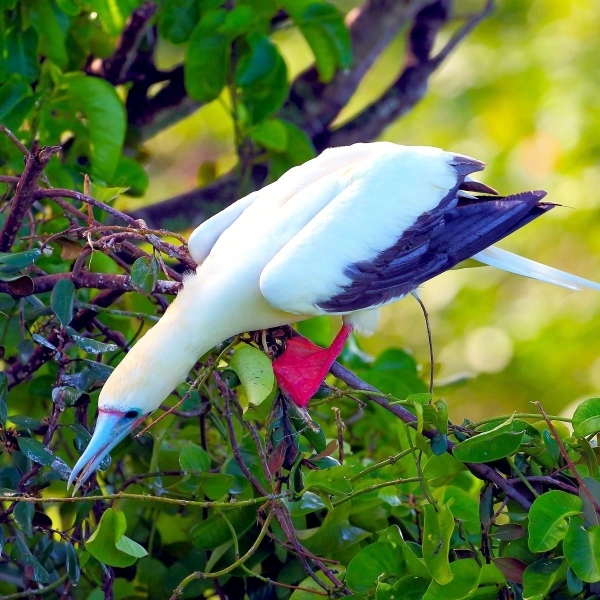 If food is scarce, the parents may abandon the young in order to ensure their own survival, but if food is abundant they may care for the juvenile for a long time teaching it how to hunt. 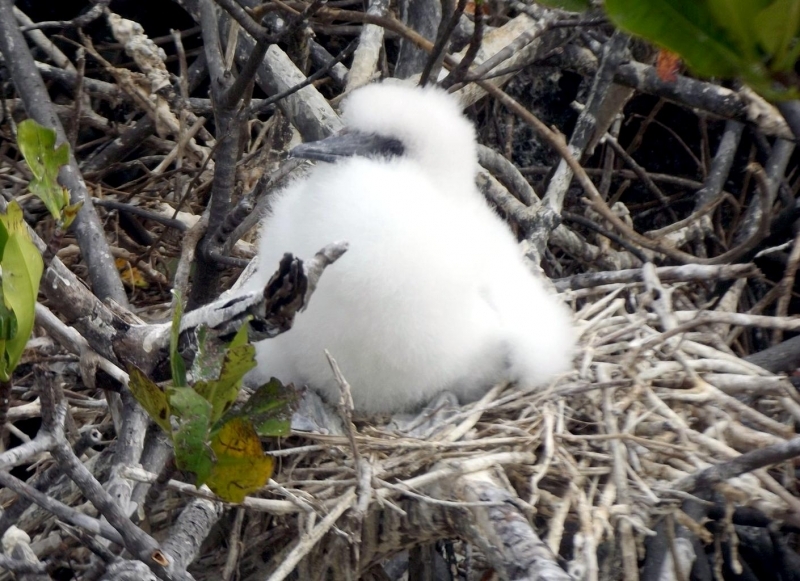 Because this bird has such a long lifespan, it can afford to raise 1 juvenile at a time and still produce many young during its lifetime. 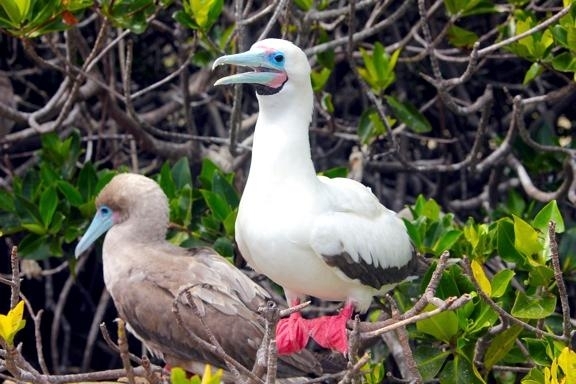 Red-footed Boobies live as sexually reproductive adults for approximately 23 years but can live for more than 40 years. 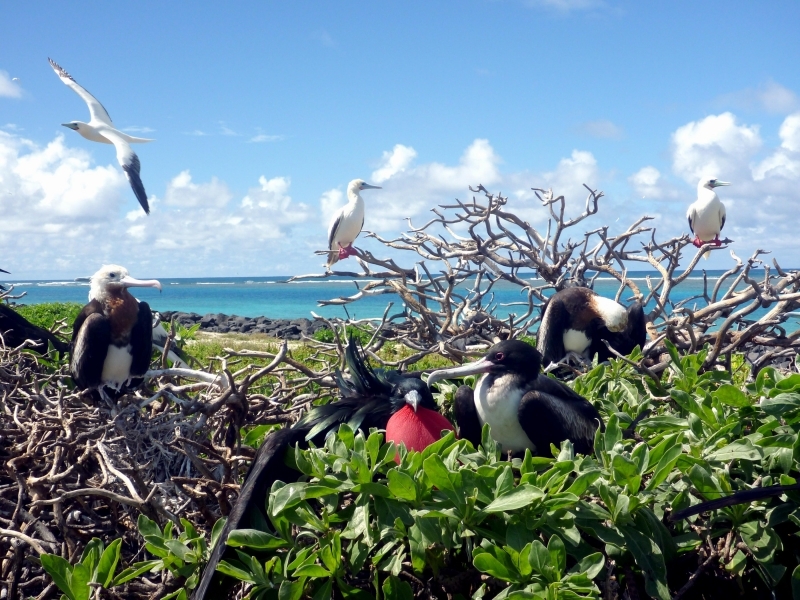 They are highly social birds and as such have developed highly ritualized behaviors. 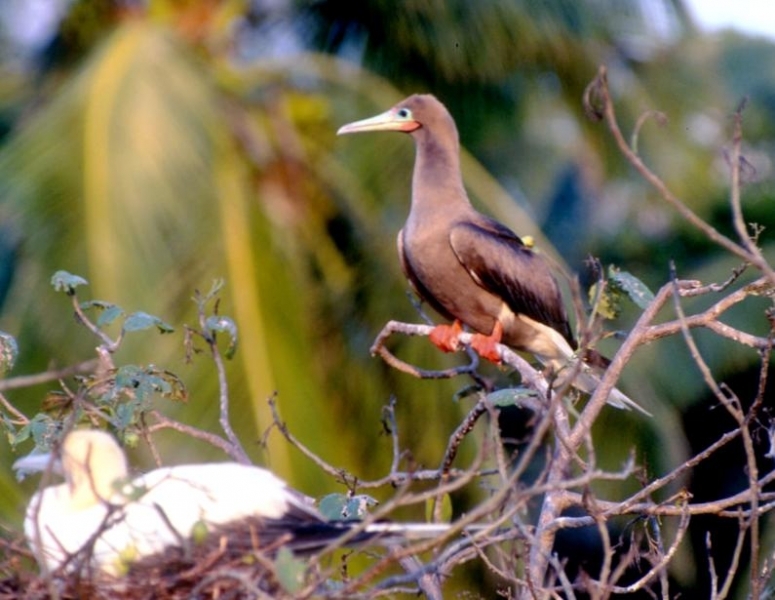 They have colonial nesting grounds, with as many as several hundred pairs in one location. 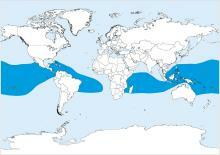 They are mostly diurnal, but have also been known to hunt nocturnally when squid come to the surface of the water. Feather care particularly oiling, is important as it prevents water-logging and helps with heat retention. This involves a bird impregnating its plumage with the waterproofing secretion produced by the preen gland at the base of its tail. Other heat regulating methods include exposing the webs of the feet and possibly excreting on them for evaporation cooling. Another method of heat loss is for the bird to hang its wings away from its body to increase its surface area and allow more heat to escape from its body. In order to retain/acquire heat, the bird may sun itself with its wings spread, to allow the dark feathers to absorb heat. 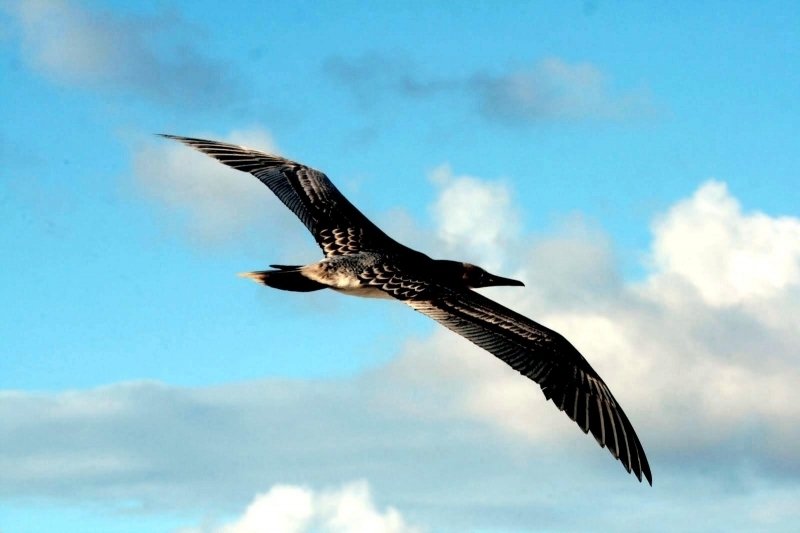 The fishing trips that it takes out to sea may last for several days, as it flies farther out. It may also follow ships out and use them to perch. 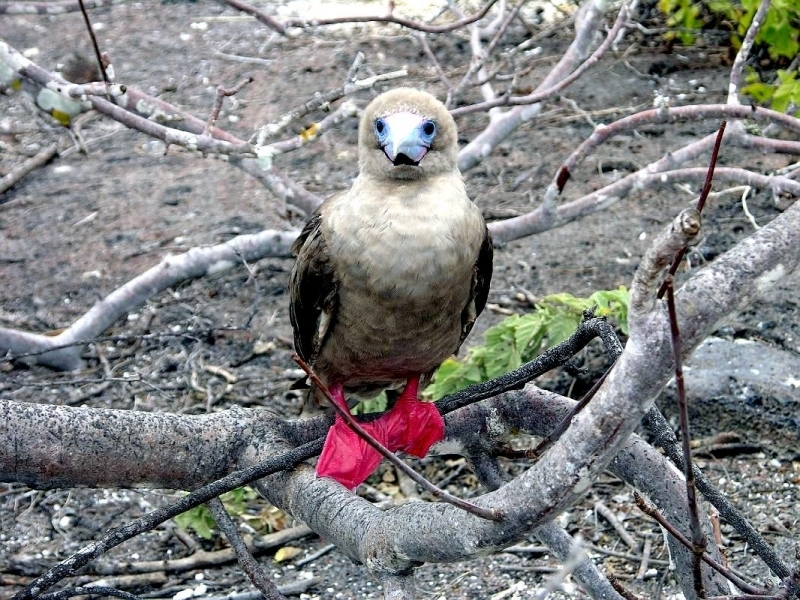 There are a variety of calls used by Red-footed Boobies. Male and female calls are different, due to structural differences in the trachea and syrinx. The male produces mild, plaintive whistles while the female produces trumpeting honks or quacks. The juveniles sound like females. The posturing that is typically used in courtship is also a form of communication. 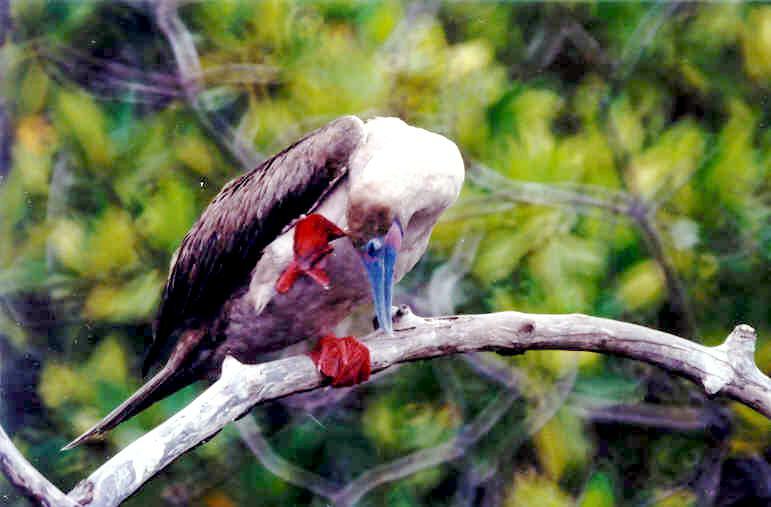 Red-footed Boobies prey on fish. 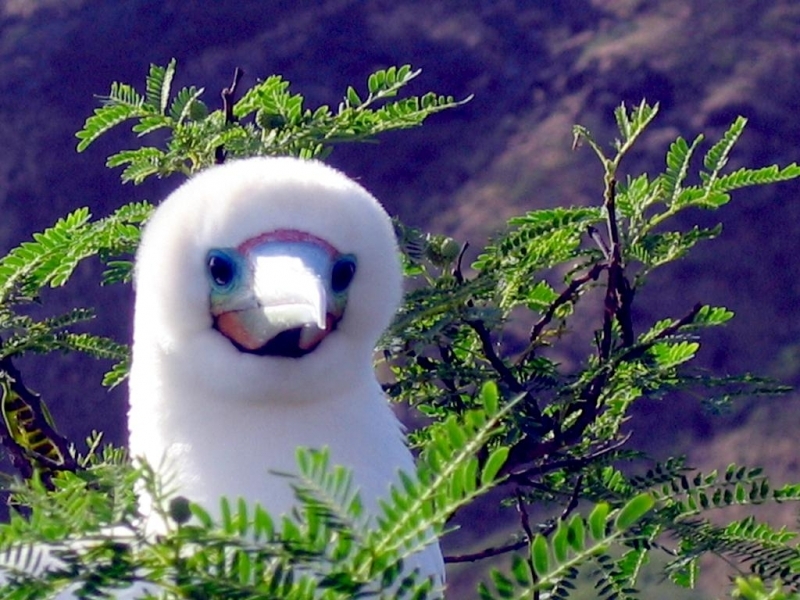 It is known to hunt up to 150 kilometers out to sea, much farther than other booby species. 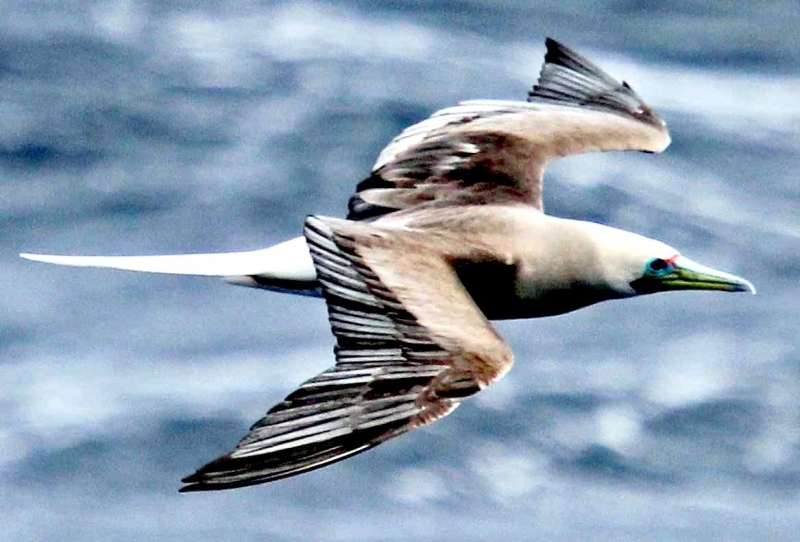 It plunge-dives to moderate depths (approximately 4 to 10 meters) in order to acquire fish, which it catches and swallows on its return to the surface. 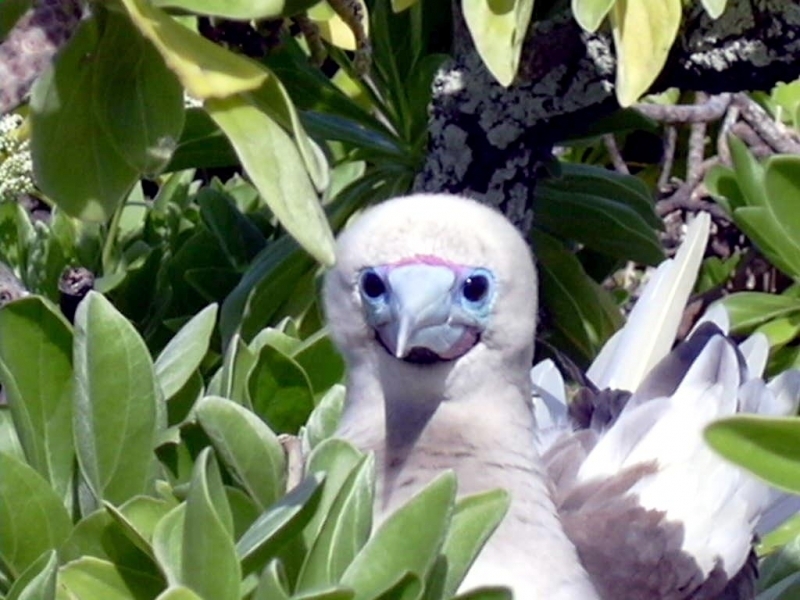 Red-footed Boobies can fly higher than other birds (10 to 30 meters) when searching for food because of their binocular vision. 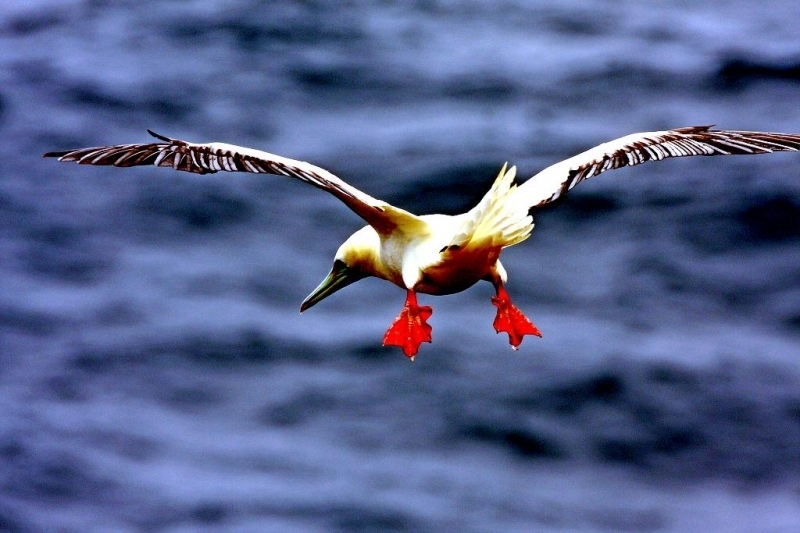 Once prey are sighted, the bird will dive straight down into the water, reaching its top speed just before entry. The larger females can often catch food that is deeper than the smaller males because of their weight. Sometimes it will also use its wings to swim deeper underwater (15 to 20 meters) to reach prey. 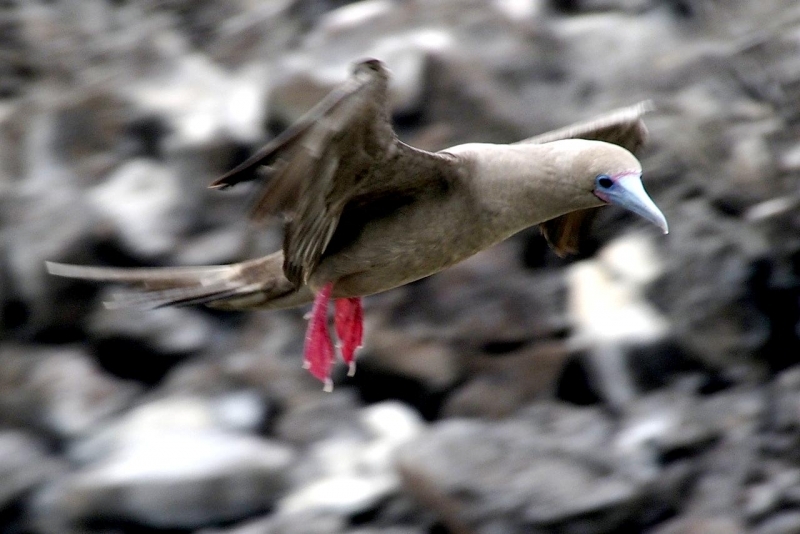 Red-footed Boobies can also catch prey in mid-flight, due to their smaller size and better agility than other species of booby. 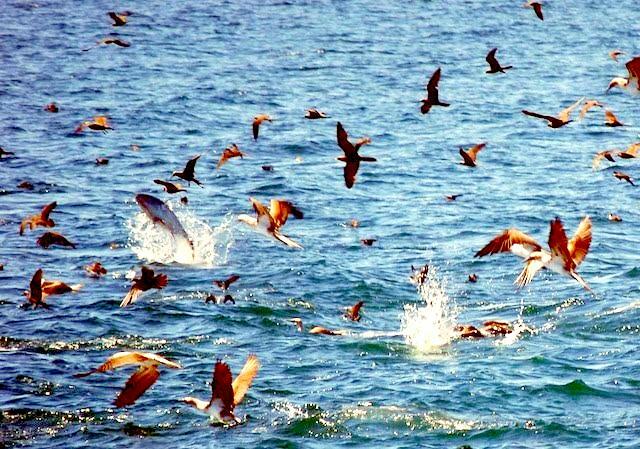 This is a particularly effective method for hunting flying fish as they jump out of the water. They are also known to hunt squid at night, as their large eyes allow effective nocturnal hunting. 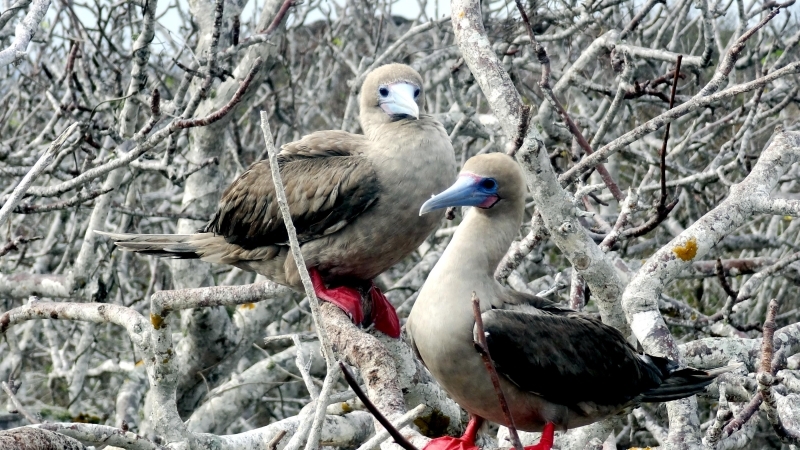 Red-footed Boobies are communal hunters and once one bird has spotted food, all will dive. 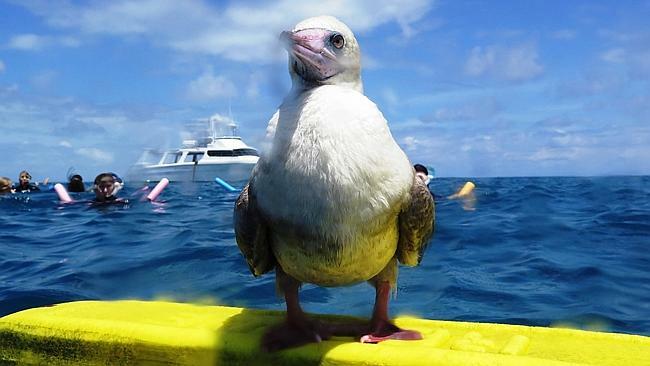 The food is swallowed before this seabird emerges from the water; this prevents other individuals from stealing it. 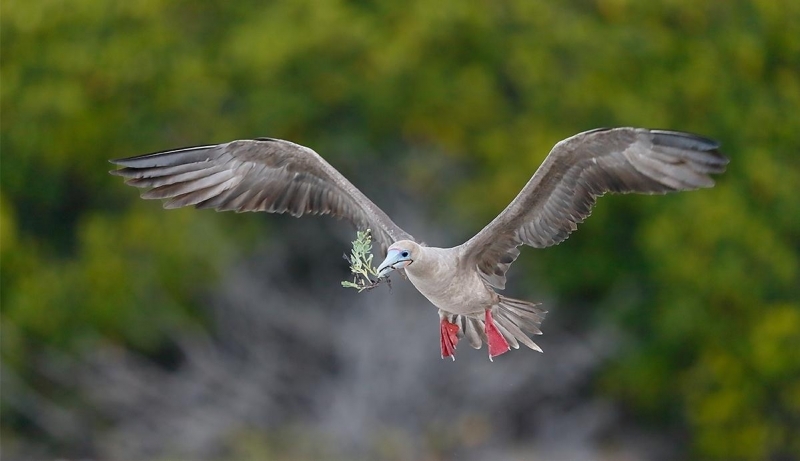 Favorite foods of Red-footed Boobies are Flying Fish, which they are often able to catch in mid-flight and squid that they catch during night hunting. However, they will eat whatever fish are available. 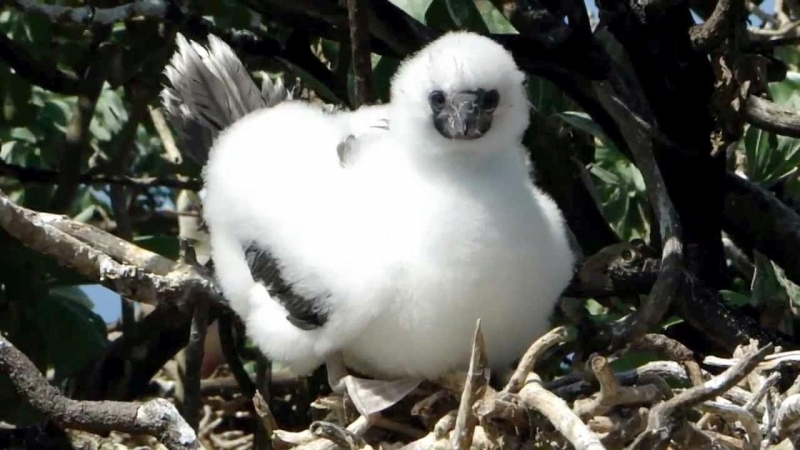 Due to the fact that this particular seabird lives in isolated oceanic areas and often spends much of its time very far from land, it does not have many predators.